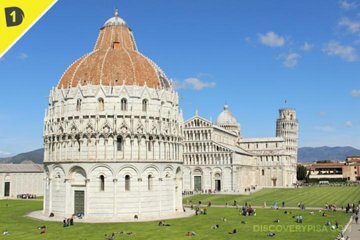 Die zum UNESCO-Weltkulturerbe gehörende Piazza dei Miracoli (Platz der Wunder) bietet einige der beeindruckendsten Gebäude von Pisa - mit verborgenen Geheimnissen aus dem Mittelalter. Erkunden Sie auf dieser Tour den Platz mit Ihrem Führer und erfahren Sie die Geschichte der wichtigsten Sehenswürdigkeiten, einschließlich des historischen Baptisteriums. Besuchen Sie die Kathedrale von Pisa aus dem 12. Jahrhundert und verbessern Sie Ihre Tour, um den weltberühmten Schiefen Turm von Pisa zu besteigen. Alessia was a funny, informative and very helpful guide. Nothing was too much for her. Would recommend her for any visitor. Took this tour as I wanted an assured ticket to climb the Pisa tower, owing to limited time we had. But in the hindsight felt absolutely satisfied that we took this tour. Our Guide was really informative,humorous and knew how to make the tour engaging. So quality wise this was top notch, very professionally handled. Now to the question do you really need the tour, well yes if you are interested in the history and anecdotes related to the construction, Galileo etc. If on the other hand all you are interested in taking some pictures of the tower and cathedral and have enough time at your disposal to buy a ticket,then may be not that necessary to to take this tour.